Who Are the Best Climbers of All Time? My friend Ryan posted a photo on Facebook of himself with an old man wearing a Patagonia down jacket and a simple fleece cap. I was impressed, “liked” it and the next day when a colleague who climbs dropped by my office I shared it with her on my smartphone. No reason that she should recognize Ryan or the 90-year old man, but I thought at least the older person’s name, Fred Beckey, would set off some conversation. She tried to play it off coolly, and nearly got away with it but I guessed her silence indicated something else. So I went on to tell her about him and his many first alpine ascents in North America. We proceeded to talk about who’s who in climbing on and off for the next few days. Our conversation over those climbers was the celebration in climbing I missed this year because of the Piolet d’Or. The 2013 Piolet d’Or was a disappointment to nearly everyone that follows the award. All seven teams nominated were awarded. Instead of bringing focus for comparison and the inevitable disagreement, the biggest criticism this year was over the jury’s indecision. They didn’t even make an arbitrary decision, which, to some degree, is necessary for the Piolet d’Or to be credible, even if the recipient declines the golden ice axe and denounces the annual ceremony as contrary to the spirit of climbing. For everyone else that simply loves climbing and admires the climbers, identifying the best brings focus by identifying role models, heroes and heroines and their style and philosophy. 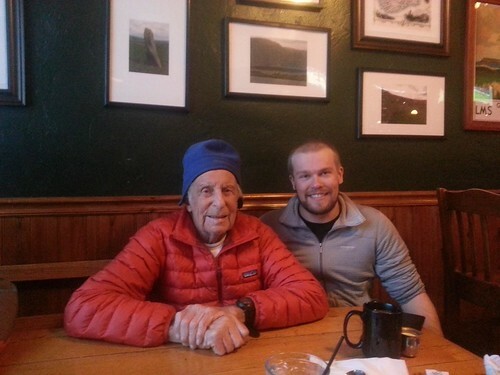 By considering Fred Beckey’s climbing accomplishments, for instance, my friend and I felt closer to him and a little closer to each other because we both valued what he has done. Whether or not he is our favorite climber ever, he was certainly a hero. So I have started on a little journey. It’s somewhat of a quest. I want to identify who are the best climbers of all time. I’ve been pondering this question for over a month now. I developed my own list of 20 names, which I’ll share later. I reached out to several friends with knowledge of climbing greater than mine in various areas of the sport, from rock to alpinism and from around the world, and asked them who are the top five climbers of all time? I asked without sharing my list; I didn’t want anyone to be steered. They’ve all given me answers and some I didn’t expect. What’s clear was the question was stimulating. It made me feel a little more alive, especially when someone recommended someone that I did not put on my list; what did they see that I didn’t? I had to ask whether my list was wrong. Was I looking at this from too strong of a North American prism? Were they? Do you? Click on this link to read Part III of this series on The Suburban Mountaineer. Thanks, Lillian. There’s some great lists on TSM’s Facebook page. I’ll share my initial list soon. Write down some for yourself before next week — you won’t regret the exercise!